I wrote several interior design pieces for Content That Works. You’re done decorating, but the room still just doesn’t feel right. That might be because you haven’t found The Thing. We talked to dozens of interior designers about their favorite item that can make a big statement without costing a fortune. Here are their picks. Position it near the foyer or dining room and have it turned on when receiving guests and during dinner. Indoor fountains create a calming atmosphere, says Rosemary Abell, a design consultant for DreamMaker Bath & Kitchen, Apex, N.C. The music created by falling water is important; make sure to hear water flowing through a fountain before you buy one. Think about whether you’re looking for something rambunctious, or something that’s soothing and more integrated into the sounds of nature. Popular are small water walls and tranquil Moorish-style pools, where side jets infuse the water with the softest of burbles. Up lights, especially positioned in the pots of floor plants, can provide immediate drama. 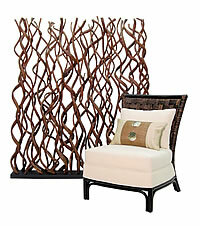 “These are great for special ambience in either the formal living room or dining room,” Abell says. Plants alone fill empty spaces, hide undesirable features and make a space feel homey. Using halogen up lights to illuminate them is especially useful in dark corners. Up lights direct light at the ceiling, which reflects it back. Lamps can be freestanding, mounted on the wall or set in the floor. Wide-beam reflectors provide ambient lighting; use narrow beams for accent lighting. Add colorful throw pillows to the couch. This is a great way to bring in beautiful colors that add warmth to a neutral-colored space. They won’t be with you forever, so take a risk with color for once, already! If your budget is really tight, make new covers for the ones you have. Use fabric to create a new duvet cover, new shams and decorative pillows for the cost of about 10 yards of fabric. The full text of this article was originally published in the News Syndicate.